Perfect for small to medium size fish and perfect for travel, the MAKO Spearguns 3 in 1 Traveler Pole Spear is three pole spears in one. Capable of taking fish weighing as much as 10 to 15 lbs, this 3 piece design measures a whopping 6' 7" and breaks down to only 27.5" long for easy storage and travel and allows you to configure the length to your specific needs. 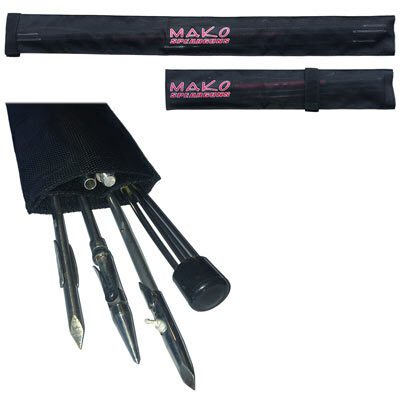 MAKO uses a high strength, corrosion resistant, anodized aircraft aluminum spear which will NEVER yield painful fiberglass splinters in the hand (like some inexpensive fiberglass pole spears do when worn down). The connecting joints of the MAKO Pole Spear are supported by recessed flush screw on connectors for a smooth release. Three interchangeable sections for 3 different pole spear lengths. One 5 prong cluster (paralyzer tip) with "sure grip" barbs on each prong. One full length MAKO "Latex Power Band" for 3 pc and 2 pc hunting. For hunting Lion Fish, you can select the optional "3-Prong Barbless Lion Fish Tip & Short Band". Designed specifically for hunting Lion Fish, the tip has 3 prongs (without barbs) making removal quick and easy, while the shorter band is designed specifically for using just a single section of the pole spear. The Pole Spear Grip Kit lets you hold longer, stronger without slipping. Installation instructions are here. 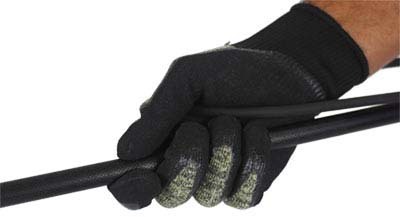 These gloves make gripping your pole spear very easy with their non-slip palm and finger coating that also provides excellent cut and puncture resistance when hunting around reefs, wrecks, or targeting lion fish, crabs & lobster. Converts your 5 prong tip to a 6 inch, heavy duty single flopper tip. Traveler Pole Spear with 6" Single Flopper Tip - Great for Halibut, Snapper, Grouper, Sheepshead, reef fish etc. Not just a typical mesh bag for your pole spear, the Optional Mesh Carry Bag is a complete storage solution for your pole spear and your pole spear tips. The Mesh Carry Bag has 2 separate compartments - A main pocket for pole spears and an accessory pocket for pole spear tips. The Pole Spear Mesh Carry Bag fits traveler pole spear sections from 22" up to 44" long. Average Customer Review: 4.5 of 5 Total Reviews: 89 Write a review. Looks like a fabulous unit, can't wait to try it. Very nice! I wish the pole circumference was a little smaller but all in all very well made!